Come and check out this extensive collection of personalized pieces from Canada. Handbags and Purses for all occasions. Come check out our selection today! 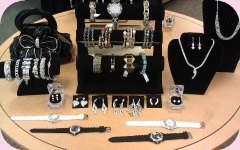 Belts, Sunglasses, Watches and much more! Bon Jos has an excellent selection of the latest fashions and hottest brands. We have a large number of American brands including Miss Me©, Rock Revival©, Yellow Box©, Very Volatile©, MontanaCo© and many more! Stop by your local store today! Tanning is as low as $3.00 a session in our well maintained, clean and modern facilities. Tux rental starting at $81! Tuxedos from Savvi Formalwear are great for any special occasion. Check out our latest Shakin' Bacon specials on Facebook! © 2019 Bon Jos Women's Apparel and Tanning, All rights reserved.